My husband finally got me to go with him to the new Sonic in town here. I really don’t like trying new foods there is just a certain amount of fear that I won’t like it and I just don’t really care for the change. But this afternoon we took the kids to the park and decided that we would go there for some lunch. I had a burger that was just to die for. The food was really good, at least what I ate. Our 4 year old ate his and didn’t complain or anything but on the way home he puked all over the third row in the van. What a wonderful smell he had discovered. It was foul I mean both of the girl in the row ahead of him were complaining. I really liked Sonic but it doesn’t look like my son will be going back anytime soon. This entry was posted in The Kids and tagged 7 month old baby, Alex, Burgers, food, kids, Puke, Sonic, The Kids. Ok so I decided that I just really wanted one so I made one. I have no idea how much of any of the ingredients that I put in but I think that it worked. I pulled it out of the oven and put the monkey bread on a plate. Then I was planning on taking a picture of it to post here but with in minuets my husband had eaten so much of it I think that he may get sick. That could be pretty. 🙁 I kinda feel bad for him. I thought about trying to snag a piece when he wasn’t looking but I was afraid that I might get stabbed with a fork. He actually growled at me. Well I am off to get him some fiber, but it is going to take alot poor guy. 🙂 🙂 🙂 All of this monkey bread eating was after he had dinner and a large piece of homemade apple pie. He is sitting on the couch talking about how miserable he is. I feel really bad but I am having trouble choking back a laugh. After reading my post he told me that I have crab grass I think he is alittle sour about me posting about him but I think he will be fine. This entry was posted in Musings and tagged fiber, food, Monkey bread. I have decided that I really really am in to Monkey Bread. I have eaten it for years growing up, but now that I am an adult I have found a very different appreciation for it. I don’t know why but I have become like obsessed. I have been looking online for a recipie for it and I don’t see any that are like my grandmother makes. It is kinda sad, and she is so busy all of the time now that my grandfather has passed that she can’t seem to find the recipie. So if any of you have any suggestions PLEASE PLEASE PLEASE let me know. 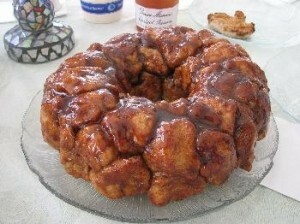 This entry was posted in Musings and tagged food, Monkey bread.